The NHL’s mandatory Christmas break usually gives the players time to relax and reflect back on the first 37-or-so games of the season. For the skaters on the Blues’ roster, that may not have been as enjoyable as past breaks in the schedule. The four-day break comes after a devastating 4-3 shootout loss to the Calgary Flames Monday night. After maintaining a 3-1 lead with 9:55 to play in regulation, Flames center Michael Cammalleri capitalized on a pass from behind the net to begin the rally and cut the lead to 3-2. After forward Patrik Berglund took an ill-advised roughing penalty with 1:37 remaining, defenseman Mark Giordano made the Blues pay with just 5 seconds on the clock to tie the game at three apiece. The Blues then spent the last minute of overtime killing off a blatant David Backes kneeing penalty, only to see T.J. Oshie, Derek Roy and Magnus Paajarvi go scoreless in the shootout. Joe Colborne was the lone scorer for Calgary. The Blues are just one of 10 teams to receive an extra day off, as they will not play again until Saturday evening when they host the Chicago Blackhawks at Scottrade Center. The rivals from the North will battle the Colorado Avalanche Friday night at United Center before hopping on the team charter, headed to St. Louis, to play back-to-back Central teams. But sitting out another day may not be the worst occurrence for the Blues, who currently sit in second place of the Central Division. The added day gives banged-up players an extra night of rest. 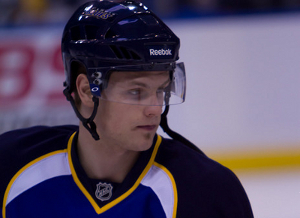 Top faceoff man Vladimir Sobotka, placed on injured reserve last Friday, and leading-scorer Alexander Steen, listed as day-to-day with an upper-body injury, could use the extended break. Sobotka has missed the last five games with his ailment. Before his injury, Sobotka led the entire NHL with an impressive 61.8 percent on draws (223 wins on 361 opportunities). 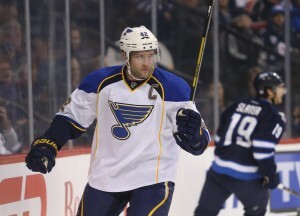 Steen is still the league’s second-highest goal scorer, contributing 24 tallies in 35 games. 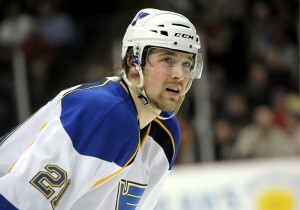 The Blues would be well served to have the two top contributors in the lineup against the Hawks. After all, Steen has scored two goals in two games against Chicago this season, including the game-winning marker on Oct. 9. Sobotka was quick on the draw in both matchups, winning 76.5 percent of his chances (13 wins on 17 opportunities). Blues beat writer Jeremy Rutherford stated in his chat yesterday that the club did not have word on the condition of Sobotka and Steen, but the players report back at 3:00 p.m. today. News on whether or not they will be ready for battle could be known as early as the evening. All the stars need to align when the Blackhawks roll into town. The Blues are hoping that will be the case on Saturday.